A French lieutenant makes a bet that he can seduce any woman in town in the two weeks before his regiment leaves for maneuvers, but his chosen target (a Parisian divorcée) isn't like other girls he's known. An old bum becomes infatuated with a pretty young girl who gets entangled with a young gangster. I have been puzzled by some of the other comments so I am adding one of my own. I think your reaction to this movie comes down to two words: fantasy and charm. It is a fantasy, and it has a very great deal of charm. If those appeals to you, you will enjoy this movie immensely as I did. If they don't, well the movie is so good you will probably still like it anyway. I rated this film a 10 because I couldn't find a thing not to like. Gerard Philipe is charming (that word again) and appealing. All the women are gorgeous. The supporting cast is excellent. And since Phillip's character Claude is an aspiring composer there is a great deal of beautiful music in his dreams. What I noticed especially about the film was how Clair kept inventing ways to keep the idea fresh. You might think that a movie which basically shows a man's dreams would fun out of steam pretty fast but Clair is clever enough to keep it fresh and entertaining. For example, Claude constantly says that all he wants to do is sleep--and given his dreams, who wouldn't--and his friends interpret this as expressing a desire to commit suicide! So the efforts of his friends to prevent his "suicide" throws a new wrinkle into the story. My only complaint with the VHS version I saw were the English subtitles. First, they were in white, so that anytime they were in front of a white background you didn't know what the speaker was saying. 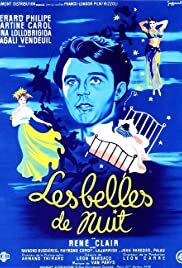 And second, even though I don's speak French I am sure that the English subtitles came nowhere near doing justice to the original French dialog. This is a worthy candidate for a Criterion DVD. An unhesitant 10 out of 10.